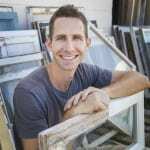 Say you’ve got an old house full of old hardware that has developed a nice patina over the years, but you have a few missing or broken pieces of hardware. Maybe a missing window latch, a door escutcheon, and a couple finger lifts. You can always find replacement hardware no problem, but the chances of it matching the color of your old stuff are pretty slim. I’ve fought this battle for years in my business. I’ve bought the oil-rubbed bronze faux finishes available at hardware supplier only to scratch the surface or scuff the screws and then they don’t match anymore. I’ve spray painted, which never looks quite the same, plus it gums up movable parts. A couple years ago, I started experimenting with bronze aging solutions. 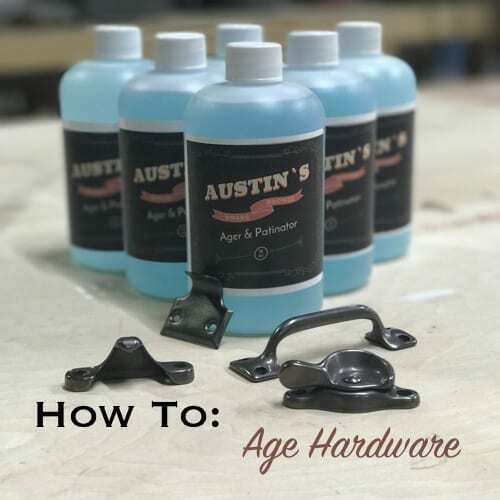 I’ve tried a bunch of them and customized them to get the right finishes we need for our projects and finally came up with a good formula that does almost everything we need for aging hardware. It wasn’t until one of my crew mentioned that I should sell it that it even crossed my mind. 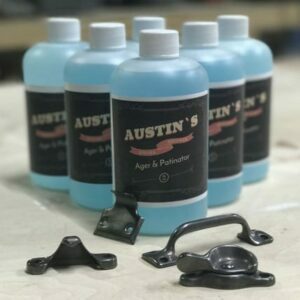 So, after a little packing and finalizing the formula, I’m happy to offer you my new bronze and brass aging solution which is my custom blend called Austin’s The Patinator. Aging solutions are very simple. They consist of a variety of acid compounds that greatly increase the speed at which the metal ages. Kind of like soaking iron in salt water, but on steroids. You soak in an aging solution to cause the metal to age in minutes what would otherwise take years or decades. You’ll need just a few items to age your hardware to a nice patina. 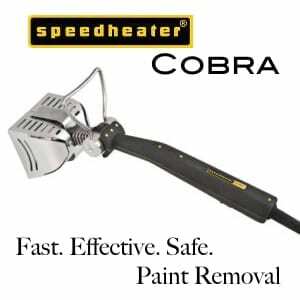 Make sure your hardware is clean of any sealer or lacquer. A lot of new bronze hardware is sealed with lacquer to keep it from aging, which will also keep The Patinator from doing its job. You can use lacquer thinner and steel wool if it does have this protective layer on it. How do you know if your hardware has been lacquered? Dip it into Patinator and if after 10-20 seconds you don’t notice any color change, then it likely has been sealed. 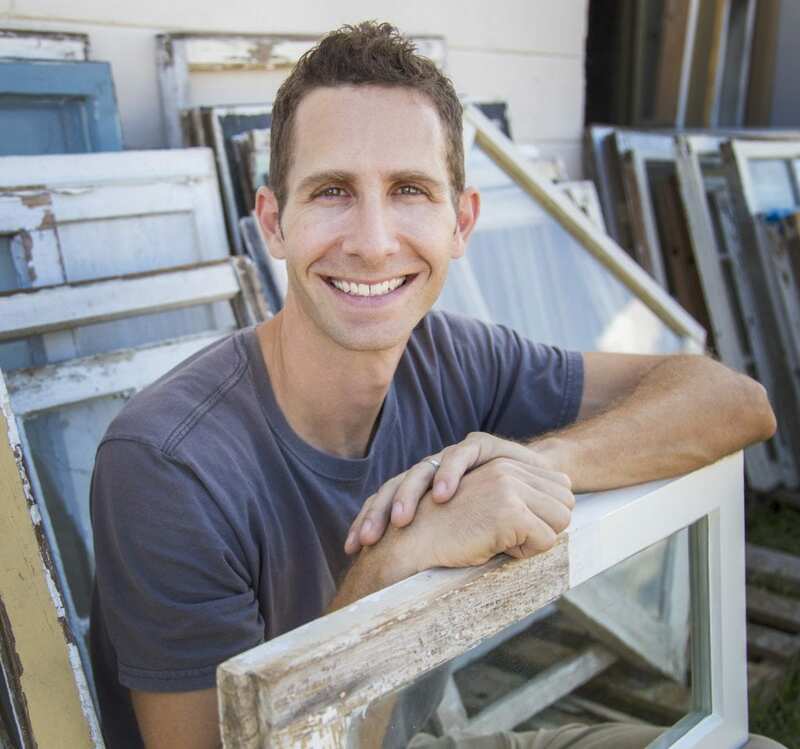 If you are aging older hardware, then make sure there is no paint or other gunk built up on the surface. Put your gloves and safety glasses on and get ready to age some hardware. Fill one container with aging solution deep enough that the hardware will be submerged and fill the other with rinse water to the same height. You can pour the used Patinator back into the bottle when you are all done and use it over and over again, even though the liquid will have darkened. The Patinator works fast, so you will likely not need to keep the hardware submerged for more than 30 seconds to 1 minute. If you want a slower working time, you can dilute it with water to suit your needs. 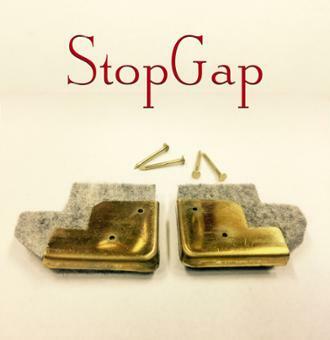 Place as much or as little hardware as you can handle into the solution and mix it around to make sure every part is coated well. Let it soak until you have reached the color you desire, and immediately remove the hardware from the aging solution and place it in the water to stop the reaction. Again, mix things around to make sure all sides are cleaned. Don’t forget to do the screws too so everything matches, unless you like those shiny bronze screw heads against old dark bronze like I do. Wipe the hardware down with a cotton rag to get the excess residue off. You’ll be left with a satin sheen and a living finish that will continue to age naturally. You just gave it a head start! If you went too far with the aging process, don’t fret. You can use a wire wheel or steel wool to clean off the patina and start again until you get the right appearance. It’s best to test just one piece so that you can get a feel for the timing and results before committing a whole batch of hardware to The Patinator. It can be polished off, just like rust on old steel. 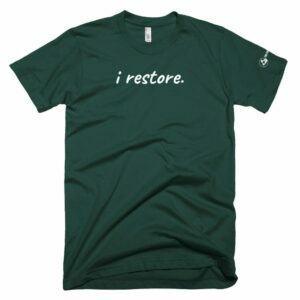 I hope this new product helps you get that restoration job done faster, easier and better than before. I know this will give you professional results just like we get at our company. You can buy your bottle of The Patinator in our store. Stay tuned for more good stuff coming out every month! Did I read that this product contains phosphoric acid? The pulls I want to change are either stainless steel or a metal that has that color. I soaked them in hot vinegar and that caused them to have a whitish coating that washed and wiped off. I am not sure if your product will darken this metal to a bronze look that would somewhat match other metal in the room. I’ve been helping a friend with their old windows and the top sashes of their big 1800’s windows. I’d like to take them out to re-glaze, but it is hard to tell if all the exterior caulking is giving us this much trouble OR if there is some sort of upper latch? Each window has a dime sized metal hole at the center of the top rail of the top sash. Inside is a screw that appears to go through another piece of metal and then the wood of the window. Have you seen this before?? Update: Just got the sash out. Don’t think it was any sort of latch. Perhaps just a simple pull? Would it have helped someone grab and pull the top sash down using a long stick with a hook? I just don’t know and am now so curious!!! Awesome tips Scott! Haven’t tried it myself but I’m very interested to do it, really.